More Blink charging stations are coming to over 125 Krogers locations in key markets including Phoenix, San Diego and Los Angeles. Electric car charging and shopping trips go together like chips and salsa. While you're inside the store anyway, your car can be outside recharging. With the expansion of a partnership between ECOtality and Krogers, announced on Monday, you could refuel your chips and salsa fix while refueling your electric car at the charging station out front. 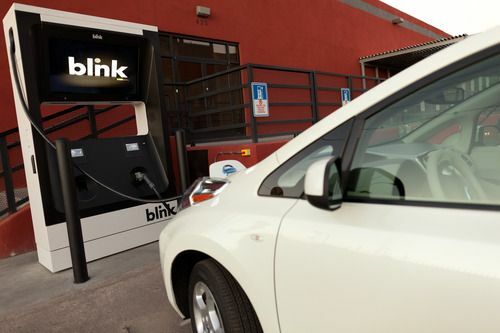 ECOtality, the operator of the Blink Network of electric car charging stations, and Krogers, the grocery store chain, first started installing charging stations last summer, in June 2012. The expansion announced on Monday will see at least 200 "level 2" (240 volt) charging stations and 25 "level 3" (DC Fast Charge) stations installed at Kroger stores across the country. The installations are receiving federal funding support through The EV Project. Once installed there will be more than 300 Blink charging stations at Krogers stores. Kroger is making a $1.5 million investment in the project. It will cover 125 locations in in several key markets including Phoenix, San Diego and Los Angeles. The existing Blink charging stations at Kroger stores include 60 already installed in Oregon and Washington, and 14 in Texas. It's widely understood by retailers that the longer a customer stays in a store, the more they're likely to spend in the store. Additionally it's known that electric car owners tend to frequent places where they can charge their car. Both those factors make EV charging facilities an excellent addition to the shopping infrastructure.